Credit: Image courtesy of Keunyoung Kim, Wonkyu Ju and Mark Ellisman, all of the National Center for Microscopy and Imaging Research at UC San Diego. Whether you see the gossamer wings of a butterfly or the delicate opened petals of a flower, there is beauty in the eye of the beholder — a mouse retina described and visually captured by scientists at the National Center for Microscopy and Imaging Research (NCMIR) at University of California San Diego School of Medicine and Shiley Eye Institute at UC San Diego Health. The confocal microscope image, which depicts a mouse retina sparkling with fluorescent molecules, has been awarded first prize in the National Institutes of Health's 2016 Combined Federal Campaign "Beauty of Science," an arts competition to inspire awareness and support of federal scientific efforts. The image was featured in a study published last year in the journal Cell Death and Disease by UC San Diego School of Medicine and Shiley Eye Institute researchers investigating potential restorative therapies for glaucoma, a progressive disease involving damage to the eye's optic nerve and irreversible vision loss. An estimated 70 million people worldwide, including 3 million Americans, suffer from glaucoma, though many are unaware and undiagnosed. It is the leading cause of blindness in persons over age 60. Glaucoma is characterized by the gradual death of neurons called retinal ganglion cells, which transmit light information from the retina to the brain via the optic nerve. "Past research has suggested that targeting these cells with gene therapy designed to prevent their death might slow progression of the disease," said Robert N. Weinreb, MD, director of both the Hamilton Glaucoma Center and Shiley Eye Institute, and a co-author of the 2015 Cell Death and Disease paper. Weinreb, with senior author Wonkyu Ju, PhD, associate professor, and colleagues investigated whether a non-disease-causing virus could be used to effectively deliver therapeutic genes to retinal ganglion cells. 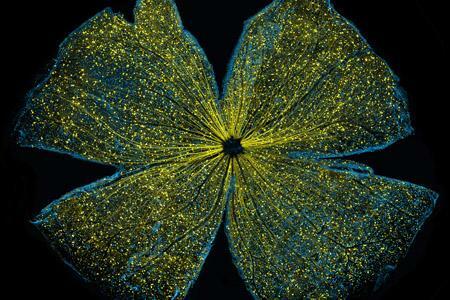 In the award-winning image, created by Ju, associate project scientist Keunyoung Kim, PhD, and NCMIR director Mark Ellisman, PhD, a virus carrying a gene tagged with green fluorescent protein (GFP) was introduced into the eyes of 7-month-old mice. Two months later, the retinas were examined using large-scale mosaic confocal microscopy, a technique pioneered at NCMIR with funding support from the National Institute of General Medical Sciences. "It's similar to Google Earth in that we computationally stitch together many, many small high-resolution images," said Ellisman, who also directs the Center for Research in Biological Systems, which promotes cross-disciplinary research involving NCMIR, the San Diego Supercomputer Center, the California Institute for Telecommunications and Information Technology and UC San Diego Health Sciences. In the image, GFP expression (yellow) is observed broadly distributed in all parts of retinal ganglion cells, suggesting the viral delivery system could deliver therapeutic genes. The blue dots indicate Brn3a-positive retinal ganglion cells. Brn3a is a marker for retinal ganglion cells. This was stained for examining transduction efficiency of AAV2-GFP in retinal ganglion cells.